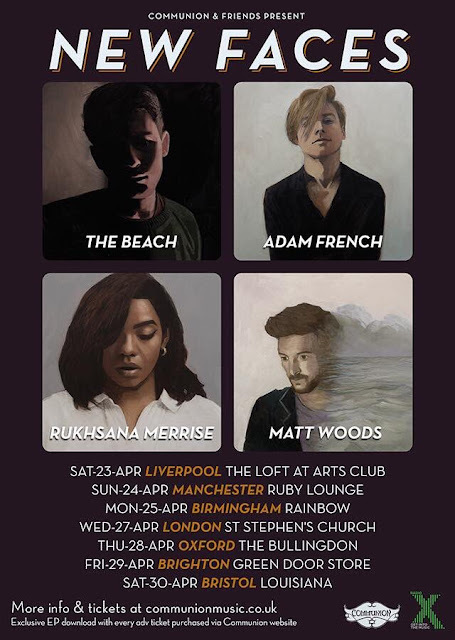 Announced today, The Beach, Adam French, Rukhsana Merrise and Matt Woods play venues in Liverpool, Manchester, Birmingham, London, Oxford, Brighton and Bristol in April for the latest Communion New Faces tour. It feels like barely any time has passed since the last tour - but it was actually announced at the beginning of September, with Flyte, Seafret, Dan Owen and Jack Watts touring in November. Other previous line-ups have featured acts such as Frances, Pixel Fix, Amber Run and Eliza & The Bear, just a small indication of the caliber of the acts. I haven't listened to any of the four new artists before, but aside from listening to a track or two from each to embed something of theirs below, I will probably leave it until I see the show in Oxford - it's sometimes nice, especially for this kind of gig, to go along without any preconceptions, hearing the music for the first time live, letting the artists sell their music to you. Tickets for the shows are available now through the Communion website, through which you'll receive an EP with tracks from the artists with every purchase.